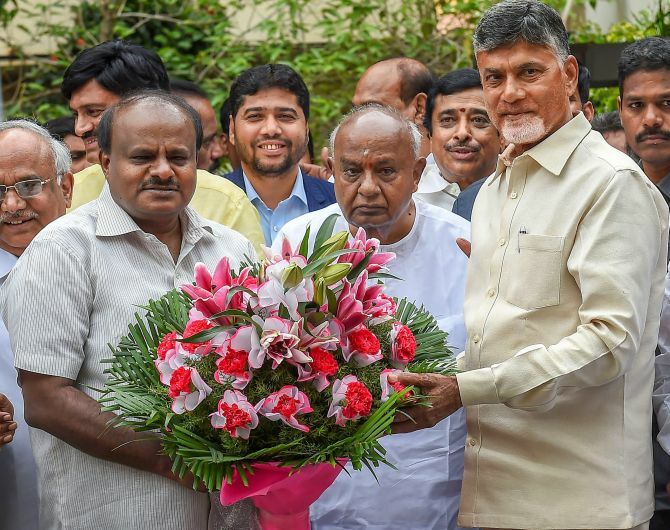 Stepping up his efforts for an anti-Bharatiya Janata Party front in the 2019 Lok Sabha polls, Telugu Desam Party supremo and Andhra Pradesh Chief Minister N Chandrababu Naidu Thursday met his Karnataka counterpart H D Kumaraswamy after which he said a grand alliance of various regional parties would be forged soon in which the Congress will be a “main anchor”. 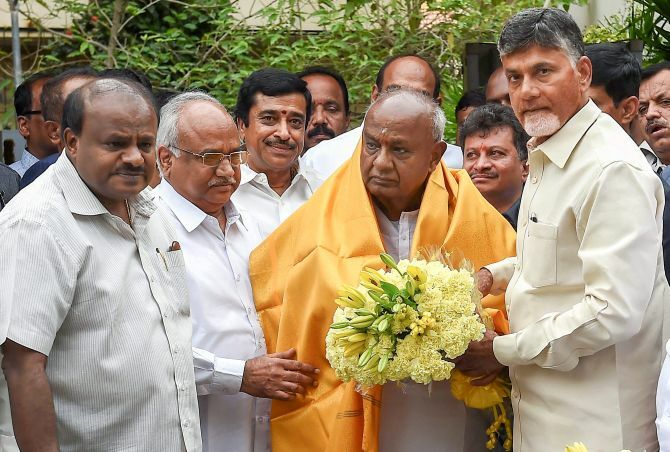 Naidu’s meeting with the top brass of the Janata Dal-Secular -- Kumaraswamy and his father and former prime minister H D Deve Gowda -- came two days after the JD-S-Congress coalition candidates defeated the BJP 4-1 in three Lok Sabha and two assembly seats in the bypolls. Setting the stage for the revival of an united front against the BJP, Naidu claimed the mood of the nation was against the BJP-led National Democratic Alliance and soon an alliance would be formed with various regional parties. “I have spoken to Mayawati, Akhilesh Yadav. I have met everybody. Tomorrow I am meeting Stalin (Dravida Munnetra Kazagham president). We will decide how to take forward the alliance with consensus. It is an initial exercise. After that we will work together,” he said. Naidu also said the Congress will be a main anchor in any “grand alliance” of opposition parties. “Congress is a major opposition party,” he said, pointing out that Deve Gowda became prime minister with support of the Congress from outside in 1996. “Congress is a main anchor,” Naidu added. However, he ducked questions on the alliance’s prime ministerial candidate. “The kind of alliance that was formed in Karnataka yielded results. Similar alliances should be formed in different states,” Chidambaram told reporters in Kolkata. “It is the responsibility of all secular parties including Congress to come together to replace NDA govt,” he said. “I think 1996 will be repeated in 2019 elections.,” he said, adding Gowda and Naidu are old friends and their arithmetic is good. BJP’s estranged ally Shiv Sena, meanwhile, took a dig at its senior coalition partner over the Karnataka result, saying it indicated that “achche din” (good days) will return for the Congress in 2019. In an editorial laced with sarcasm in the party mouthpiece “Saamana”, the Sena said the BJP probably lost in Karnataka for ignoring poll promises like construction of a Ram temple in Ayodhya and for “imposing some other agenda”.